We got some nice snow yesterday (Friday). 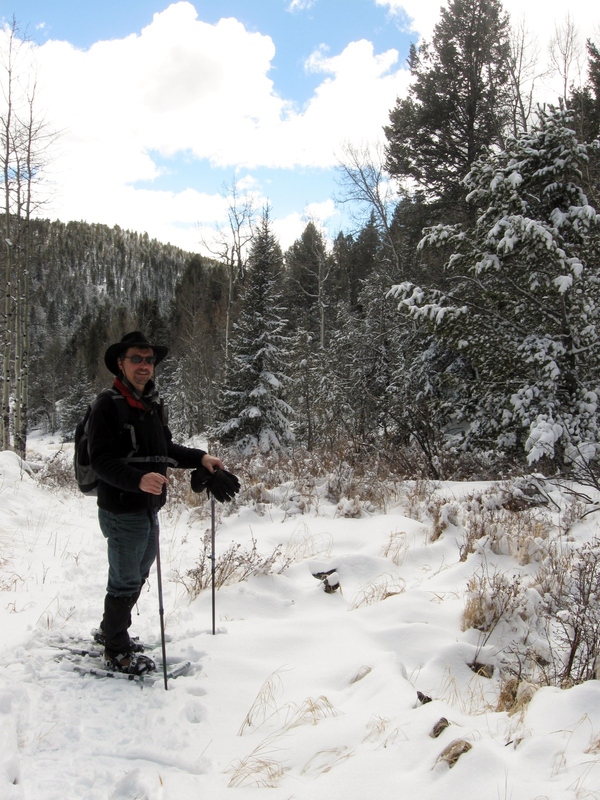 Probably 3 or 4 inches here in the Springs, so we figured it would be a nice snowshoeing day up in the mountains. We headed up to Mueller State Park, (this is the link but it seems to be broken today: http://www.parks.state.co.us/parks/mueller/Pages/MuellerHome.aspx). The roads were a little sloppy as the sun melts the snow nicely on the highway even though the air temp was only 26F. Once in the park we stopped at the Preacher’s Hollow trailhead, which is trail number 4 on the map. Turned out to be a gorgeous day with a few clouds, plenty of sunshine and with the effort of hiking it actually felt hot. Halfway through the trip I was hiking in a sweater and no gloves.